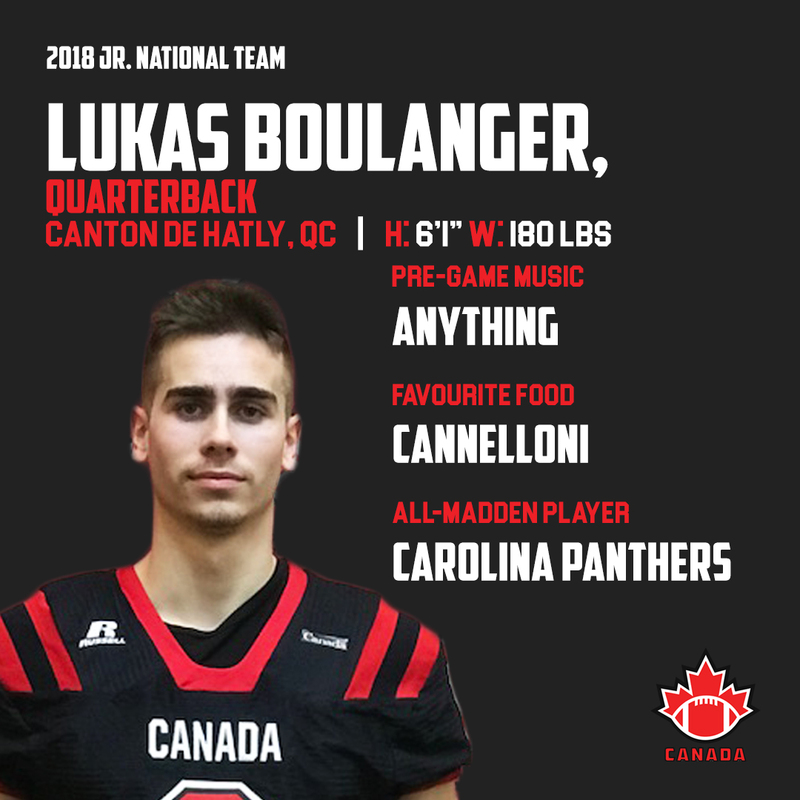 Lukas Boulanger is a quarterback from Canton de Hatly, Quebec who will be representing Canada at the 2018 IFAF World Junior Championships next month in Mexico City, Mexico. The offensive standout’s first taste of the gridiron came when he was in Grade 4. During his career, Boulanger has suited up for several teams including RSEQ Juvenile 1 team Triolet Harfangs, Dufare Patriots, Seminaire de Sherbrooke Barons and CEGEP Division 1’s Champlain-Lennoxville Cougars. Additionally, he has represented his province as a member of Team Quebec. Last July, he led the team to a gold medal over Team Saskatchewan at the 2017 Football Canada Cup in Wolfville, Nova Scotia. This past January, Boulanger led the National Under-18 squad to a victory over the United States at the 2018 International Bowl in Arlington, Texas. While he has played a lot of football, his most memorable moment is not a single event or achievement. As for role models in the sport, Boulanger says Kansas City Chiefs’ offensive lineman Laurent Duvernay-Tardif is someone he tries to emulate on and off the field. Moreover, his inspiration has been his father. From the moment he received the email that he was going to Mexico City, Boulanger is stoked that his dream has come true to represent his country at the 2018 IFAF World Junior Championships.